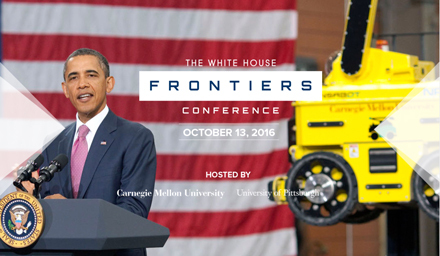 Last week President Obama hosted the first-ever White House Frontiers Conference in Pittsburgh, an event co-hosted by the University of Pittsburgh and Carnegie Mellon University. Esri was among many of America’s leading innovators invited to come together to discuss how we can empower people through science, technology, and innovation to lead our communities, our country, and our world into the future. There were five “frontiers” of innovation that kicked off the conference in five separate tracks: personal, local, national, global, and interplanetary. Within the Global Frontiers Track, I was asked to lead off the subsection entitled Climate Information, Tools and Services for Enhancing Resilience. In my remarks (downloadable at esriurl.com/frontiers), I sought to give a broad perspective on how scientists and managers think about and visualize the world for on-the-ground resilience to climate change, what innovative partnerships and opportunities are in this space (including the participation of Esri and others in the President’s Climate Action Plan and Climate Data Initiative), and what is some of the cutting edge in moving the field forward. This set the stage for three lightning talks expanding further on this theme, by our colleague Jed Sundwall, Global Open Data Lead of Amazon Web Services, Brooke Runnette, new Executive Vice President and Chief Exploration & Impact Officer of the National Geographic, and Laur Hess Fischer, Project Manager of Climate CoLab at MIT. Laur and her Climate CoLab group is also in partnership with our colleagues at the American Geophysical Union within its Thriving Earth Exchange for connecting local decision makers with the science needed to optimize community (geo)designs and plans. The track concluded with interactive breakouts and visioning discussions about what the country might look like in 2100. Esri Government Strategist Pat Cummens participated in an urban planning charette. I was in a more traditional breakout on climate data and information that focused on: (1) what science based tools are currently available to support local climate resilience planning; (2) How can we better use visualization tools and technologies at the local level, engaging as many citizens as possible in the process; and (3) Where are the gaps in connecting scientists and decision makers at the local level?